As Marvel begins its new reboot initiative “All-New Marvel NOW!” we’ll be seeing quite a few new comic series hitting the shelves in the coming weeks, and while few of them are wholly original titles, there are some that boast a title unseen in Marvel comics. 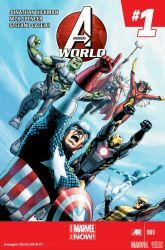 The first of these is Avengers World from writers Jonathan Hickman and Nick Spencer with art by Stefano Caselli, which spins out of their most recent event “Infinity” into its very own series. The premise of Avengers World is that The Avengers have made themselves more accessible to S.H.I.E.L.D. for any problems they might need help handling, which apparently is a lot. Hickman and Spencer have brought a similar approach to their work on the flagship “Avengers” title for the new series and this consists of a more formal and grounded approach to the ideas of superheroes and top secret agencies. Though this can lead to some very interesting stories, it also gets bogged down in just how serious it takes itself. While the story itself appears interesting on the surface and ties into other comics currently being published in a fashion that will make readers happy there’s at least some synergy, it’s hard to get a full grasp of the series’ intentions when it begins four different storylines in the first issue. No doubt it all will come to pass as the series unfolds, but for the time being it’s a lot to process for seemingly little benefit. Stegano Caselli’s art is no question the highlight of the comic. He shows off a wide range of potential with the title, and given its globe hopping nature, I’ll be looking forward to what he brings to the table with future issues. Hickman and Spencer’s reveals in this inaugural issue, while cool on paper, are elevated by Caselli’s artwork as his jawdropping splashpages make the rest of the book feel cluttered. The clutter in the issue could be intentional though, as it makes the big moments even more special, but what hurts it is the exhaustive amounts of exposition. I’m unsure if Marvel is throwing their weight behind this title like they do the regular “Avengers” book, but I’d say that Caselli’s work is just as on par with what Jerome Opeña and Adam Kubert have done on the other titles. What I think is the big selling point for Avengers World, beyond Caselli’s artwork, is that it tries to use members of the team that don’t get much face time elsewhere in the Marvel U. Though Hyperion, Falcon, Smasher, Spider-Woman, Shang-Chi and others appear in the regular Avengers title, here you get at least a glimmer of time spent with them. Though this once again leads into the problem of crowding the page. Sure we get more time with Hawkeye and Spider-Woman than normal, but once their fraction of the comic is finished, it jumps right back to the focal point of the issue, Captain America calling the shots. Avengers World houses a lot of story for a comic no longer than Marvel’s other issues, and it maintains a consistent pace of character reveals, short surprises, and exposition while mostly skimping on fun sequences. Caselli’s art is top notch though and certainly makes the dramatic reveals and action sequences (as short as they are) worthwhile. Like the regular “Avengers” title, Avengers World takes itself very seriously and sometimes that makes it a bore. Head to page 2 for our review of All-New X-Factor #1!